F@*k the statistics. Go write. 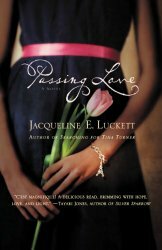 I first met the amazing Jacqueline Luckett about ten years ago on my first writing retreat. We bonded over a mutual love of jazz and books. She’s a joyful presence, and I feel lucky when I get to spend time with her (which isn’t as often as I would like). She’s the author of two gorgeous novels, SEARCHING FOR TINA TURNER and PASSING LOVE. I asked Jackie to share her thoughts on being an African American writer in publishing today. Here’s what she had to say. Terry McMillan broke a glass ceiling. Though there were many established, superb writers before her, McMillan’s commercial success brought a new awareness to the publishing world. First, that black women not only bought books, but also read voraciously. Second, McMillan’s books appealed to all women. I read someplace that before she achieved her phenomenal success she sold her books out of the trunk of her car. True or urban legend, I’m sure McMillan has plenty of stories about the difficulties she had getting published. Most Black writers do. In 2007, my writing group was featured in O Magazine. An agent contacted me. I sent her the manuscript for my first novel, SEARCHING FOR TINA TURNER. She loved it. But her comment was the kicker that sticks with me to this day: “I just don’t know how to sell it.” Bottom line, her words had nothing to do with my story, but rather they spoke to the only market she believed would be interested: African Americans. She argued that the flurry McMillan’s work created had died. She didn’t know where to sell my novel. Not because it wasn’t good, but because she didn’t have any African American publishing contacts. I can only believe she thought her white editor contacts wouldn’t buy a novel about a black character written by a black woman. That little piece of information stung as badly as if he’d slammed a door in my face. I could take off in many directions with these two anecdotes. Yes, it’s harder for Black writers to get published certainly because of these attitudes still pervasive in today’s tighter publishing market. Sadly, it sometimes seems to me that publishers are more interested in our stories filtered through the lens of the white writer. I suspect that every African American writer has a story about the difficulties of getting published, about our stories being rewritten by whites that soar to the top of national bestseller lists and eventually become big screen hits, about the agent who says that she just wouldn’t know how to sell our books, or the assumption that our work doesn’t have a broad appeal. What is most important for me to share is that I didn’t/haven’t/won’t/ let any of the BS stop me. And neither should any Black writer. I’m not looking for sympathy. These are facts. Understand that after hours, days, years of writing, we African American writers start our search for publication facing barriers that have to be broken down just to get our work to the publisher’s door. Hence, a double whammy. Clearly, that barrier doesn’t apply to every African American writer. If Toni Morrison, for example, wanted to change publishers, they’d come running after her before she put a period on her declaration. Sadly, their enthusiasm doesn’t apply to all of our work. This Black woman refuses to accept that crap. I’m a good writer. I tell great stories. I create believable, characters with a wide, borderless appeal. I intend to keep pushing for continued publication in every way I know how. – Write the best story you know how, and if you need help, get it from sources that will make your writing soar. – Don’t let anyone tell you what to write about or force you to turn your Black characters into white ones simply to sell your book. – Find an agent who believes in your story and will sell it to a publisher who loves it equally, if not more. – Seek out your sister-writers for support, for advice, for the shared bond of understanding. You are not alone. Seek the support of every writer you know or meet, regardless of color, for the same thing. But, most of all, f@*k the statistics. Go write. GIVEAWAY: Comment on this post by Noon (EST) on Friday, August 7th to win one a copy of PASSING LOVE (U.S. only). Follow The Debutante Ball on Facebook and Twitter for extra entries—just mention that you did so in your comments. We’ll choose and contact the winners on Tuesday. Good luck! In 1999 Jacqueline Luckett left the corporate world to kickstart her writing career with classes she took on a dare—from herself. Reinvention, self-awareness, and self-fulfillment are themes throughout Luckett’s novels. She strives to write compelling and interesting stories while addressing fear and what can be done to conquer it. “We can all afford to be fearful, but we can’t let fear keep us from doing what we want or need to do.”Jacqueline encourages her readers to avoid deferring their dreams: “The length of time it takes to get to the dream is not as important as fulfilling the dream.” Jacqueline, a native Californian, lives and writes in Oakland, but takes time out to indulge her love of traveling and to nurture her passion for photography and exotic foods. Amazing post! Thank you for sharing with our readers! Thank you for this. I am a white woman but felt a big release of relief as I was reading that you were even talking about this, and so honestly. I really appreciate that. *** “Black women read everything, white women do not.” I haven’t thought about my reading habits in those terms. Thank you for putting into this head so I can really think about it. *** The point below was a surprise to me, but now I’m just shaking my head thinking “why are you surprised?” Wow. “– Don’t let anyone tell you what to write about or force you to turn your Black characters into white ones simply to sell your book.” WHAT? Seriously, that happens? It’s incredibly insulting — and racist really — but it also doesn’t even make sense. *** “She thought her white editor contacts wouldn’t buy a novel about a black character written by a black woman.” The implications there are mind-boggling. And yes, I am a big Terry McMillan fan — also Bebe Moore Campbell who wrote in the same kind of genre I think. And many more African American women writers of course, but few of those are in the kind of “normal books” genre.. And what is the “normal books” genre, you ask? I don’t know how to describe this well… novels about real, everyday life, I guess. I wonder whether I’m not experiencing kind of the reverse of the problem you describe “the agent who says that she just wouldn’t know how to sell our books, or the assumption that our work doesn’t have a broad appeal.” Where are those books? Why aren’t they accessible to me? I want to read them. African American women writers have trouble getting them published; and they are not in all the usual places (read: white places?) for me to find. Okay. So now I’m off to find yours. I was very fortunate to sit next to Jacquelyn at a Sonoma County library fundraiser. Even though there are some well known Asian American authors now, I am still up against the complexities of what agents think they can sell and stories by and about minority populations can be a harder sell. Part of what I love about reading is learning new things including new cultures. It’s interesting to find that there are many similarities in how we love and lose but also how our ethnicity shapes our psyches. I recommend your books written by women of color to all my friends. Though I do have to say I am pleased to recommend books by authors such as Jacquelyn and Renee Seindle and others to friends of color because of the lack of books written by women of color and Ilthink we all need role models. Especially younger women. Sorry for the poor writing form. I’m on my phone and hard to proof read. I knew going IN that my work would be discounted. I also knew that even if they DID consider my work, editors would destroy my voice in their rewrites because they could not relate to the expressions and nuances of my life’s experience. I didn’t even consider traditional publishing. The industry wouldn’t allow me to consider it. Thank goodness, I don’t have to! I haven’t a clue about “street-lit” and I don’t write about African-American heritage. I write about what IDW please and after 20 years, I’m happy to say that I actually have a following who enjoy the stories In the end that’s ALL that matters.